A decadent, juicy honeydew melon fragrance. Light and refreshing. Top notes of sweet peach, melon with nuances of juicy berries. Heart notes of pineapple leading to powder at the base. A honeydew has a round to slightly oval shape, typically 15–22 cm (5.9–8.7 in) long. It generally ranges in weight from 1.8 to 3.6 kg (4.0 to 7.9 lb). The flesh is usually pale green in color, while the smooth peel ranges from greenish to yellow. Like most fruit, honeydew has seeds. 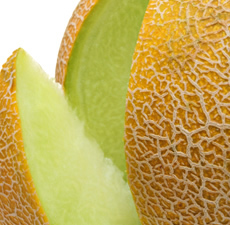 Honeydew's thick, juicy, sweet flesh is often eaten for dessert, and is commonly found in supermarkets across the world.